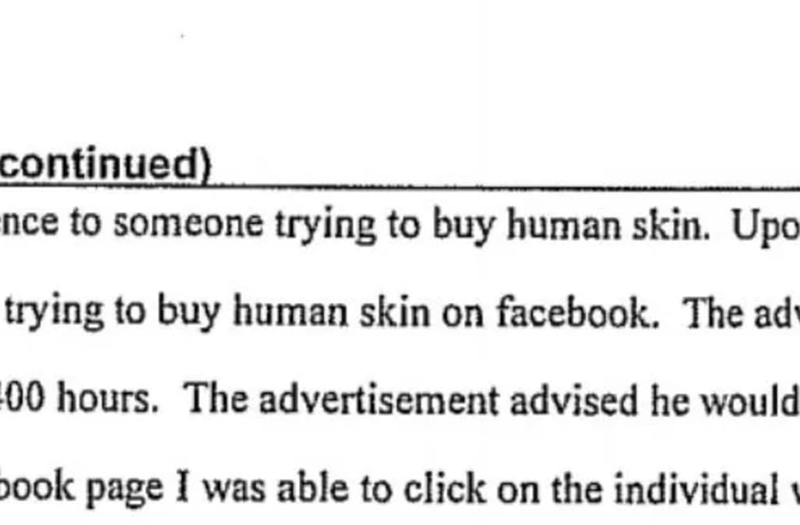 Police arrested a man in Florida for allegedly trying to buy "human skin" on Facebook for $400. A woman reported the troubling ad to a Martin County sheriff's investigator after coming across the post on "Jensen Beach Garage Sale" -- a public page that serves as a "community yard sale" for locals in the area. According to the police report, deputies went to the man's home "in reference to someone trying to buy human skin," in a post that has since reportedly been deleted. Deputies discovered the man's identity before the ad was redacted, however, and were able to run his address. The police report cites Florida Statute 873.01, which bans the purchasing and selling human tissue and organs. If prosecutors find the man in violation, he could face a felony charge, TCPalm reported. It remains unclear what the alleged buyer planned to do with the skin.